Gaming just got a little more mainstream since Amazon Co. purchased a popular video game-streaming service last August, and is receiving mixed reviews from players at SF State and within the city itself. 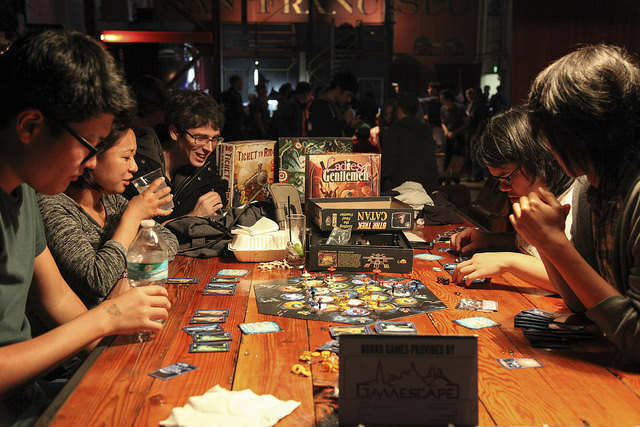 Gaming fans engage in a strategic board game at the “Churning the Butter” event at the Folsom Street Foundry on Thursday, Sept. 11, 2014. Frank Ladra / Xpress. Gamers were both surprised and relieved when the major company purchased San Francisco-based service Twitch for $970 million. SF State theatre major Eric Beck, a competitive fighting game player and president of the University’s gaming club, Student Association of Gaming and Technology (SAGAT), uses Twitch to stream his game matches online. “We know we’re the strongest players on campus,” Beck said, regarding his skills at Street Fighter, a popular fighting game. Beck participates, as well as commentates, in Showdown Entertainment’s weekly Street Fighter IV tournament, called “Churning the Butter,” at SoMa’s Folsom Street Foundry, a warehouse-sized bar and entertainment space. Showdown Entertainment, an event organizer, hosts the tournament every Thursday, where gamers from all over the Bay Area travel to the Foundry to compete, drink and play games of all genres. From Settlers of Catan to Mario Kart 8, gamers laugh, converse and compete with one another. With the sudden flick of his wrist and a button press, spectators cheered last Thursday as Beck’s Street Fighter character Zangief performed a spinning piledriver move on his opponent. A year ago, Beck was playing the same game, Ultra Street Fighter IV, in an arcade cabinet in the Cesar Chavez Student Center. Now, thousands of online spectators can watch him and other professional players pummel one another on a colossal projector. With Amazon’s recent acquisition of Twitch, gamers at the Foundry expressed interest and concern on Twitch’s future. Rumors circulated that Google had made moves to purchase Twitch, which upset players because of Google’s impositions on Youtube. Whispers of copyrighted music being blocked by Google’s algorithm daunted users who often streamed on Twitch, according to Beck. However, with Amazon’s influence, Beck said he is excited about Twitch’s future. CJ Scaduto, president of Showdown Entertainment was also seen at Thursday’s event, but holding a beer in place of a controller. Scaduto is a businessman who works for a uniform rental company, but still stays involved in the gaming community by collaborating with players, as well as Twitch, to make events like “Churning the Butter” happen. “Look around, almost everyone here has an 8-5 job in a respectable field doing things for Youtube, Google and Twitch,” Scaduto said as he waved his arms and pointed toward the crowd. According to Scaduto, Twitch streamers who play copyrighted music in the background of their videos are making money playing other artists’ music through Twitch’s integrated video advertising. With Amazon, those artists can be reimbursed for having their music played via a pop-up on the video player that gives the audience an option to purchase the song. According to Twitch’s CEO Emmet Shear in an interview with Cnet, an San Francisco-based technology review site, Twitch has driven video game purchases with partners like Amazon by linking products to pages as a way to advertise to gamers. Shear had stated to Cnet that Amazon will not turn Twitch into a store. Salvator Gomez, a Bay Area car technician, towered over the crowd of spectators carrying his gamepad as well as a smile. Gomez is a professional fighting game player like Beck and the two have clashed before at the Foundry. “That guy’s a badass,” Beck said of Gomez’s skills. The two played against each other at Thursday’s event while 1,500 viewers watched the match on Twitch last week. Gomez stated that he was reluctant about Amazon’s purchase but added that he will support everything with the two companies as long as the gaming streams remain free to watch. Beck and Showdown Entertainment have a deal with Twitch to display “Churning the Butter” on the front page of Twitch’s website every Thursday at 7:30 p.m. He stated that this deal is significant in garnering the attention of the fighting game community in the Bay Area and centralizing it in one location. Beck said he ultimately supports Amazon’s purchase of Twitch and that companies are finding different ways to keep up with players who look to online for viewing games.